This entry to our travel magazine was provided by JB Macatulad, owner of willflyforfood.net and one of the leading experts on Filipino local cuisine. I was excited when phiilippinestravelpackage.com invited me to contribute a guest post on 10 must-try Filipino foods. Being a proud Pinoy, I love Filipino food. The problem is, how can I narrow it down to just 10? I started making a list of dishes that I thought foreigners should try when visiting the Philippines. But we have so many interesting and delicious things to eat that narrowing it down to just 10 proved to be a challenging task. I found myself revising and editing, removing and adding, then removing and adding again. It wasn’t easy! So instead of overthinking this list with 10 dishes that I thought foreigners should try, I wiped it clean and listed down the first 10 dishes that came to mind. What I wound up with was an honest list that represented 10 of my favorite Filipino dishes. Enjoy! Pork sisig is many a Filipino’s favorite barchow. It has its roots in Pampanga but it’s become widely popular throughout the Philippines. 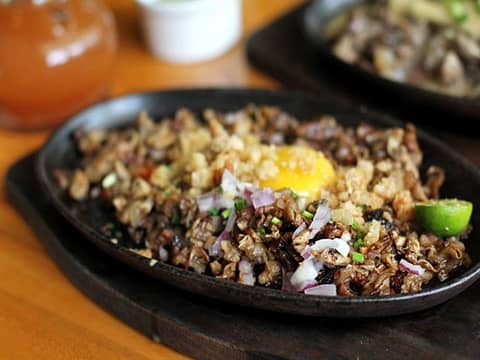 Sisig consists of coarsely chopped grilled pig’s face, ears, and chicken liver served on a sizzling cast iron plate. It’s typically seasoned with calamansi (calamondin), bird’s eye chili, Knorr liquid seasoning, and hot sauce. On a Friday night, after a long work week, you’ll find many Filipinos enjoying pork sisig and San Miguel Beers at Filipino bars and restaurants. I remember walking down a street in Malate one afternoon when I spotted this Caucasian couple eating sisig. When Filipinos order sisig, we usually enjoy it as an appetizer and share one order between many people. But not these two. They had each ordered a full plate of sisig and were eagerly and very vigorously mixing the ingredients together. Clearly, they had enjoyed it before and couldn’t wait to dig in again. I can definitely relate. 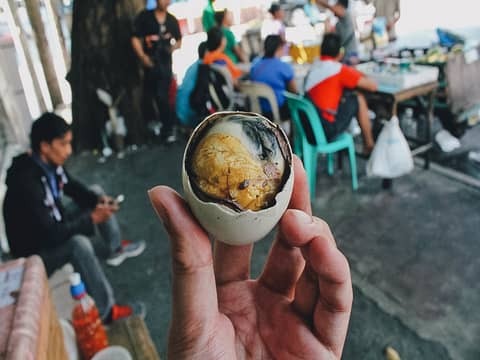 Balut made my list not because it’s one of my favorite dishes, but because it’s so damn infamous. If you aren’t familiar with it, balut is a fertilized duck egg incubated for 14-21 days, boiled, then eaten directly from its shell. It’s one of the more challenging Filipino dishes that most foreigners shy away from. I’ve been eating it all my life but I can certainly understand the aversion. I used to watch Fear Factor and I remember how balut was one of the very few dishes that made Joe Rogan retch. We Filipinos understand how repulsive balut can be to many foreigners which is why we enjoy daring them to eat it. With the exception of the French, most chicken out! 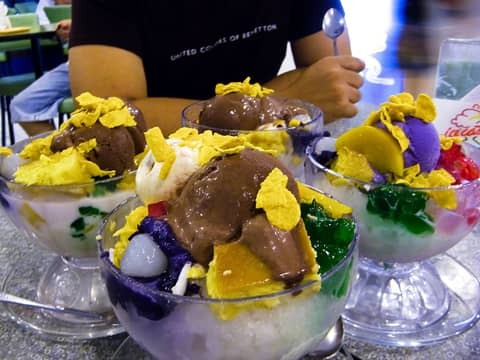 Halo-halo is one of the Philippines’ most beloved and colorful desserts. Typically served in a tall glass or bowl, halo-halo is a refreshing mix of shaved ice, evaporated milk, and a rainbow of ingredients like boiled kidney beans, garbanzos, sugar palm fruit, young coconut, and sweetened plantains. Frequently topped with ice cream and/or leche flan, the name halo-halo means “mixed together”, which is exactly what you’re supposed to do when the dessert is served to you. Using a long spoon, you dig into the shaved ice mixture and jumble it all up until you have a soppy concoction of milk and refreshingly sweet ingredients. On a hot summer’s day, absolutely nothing beats halo-halo. Adobo is a Filipino national dish. It comes from the Spanish word adobar which means “to marinate”. It’s made by marinating meat in a vinegar, soy sauce, peppercorn, and garlic mixture. It’s most commonly made with chicken or pork, but my favorite is adobong pusit, which is adobo made with squid marinated in its own ink. Delicious! 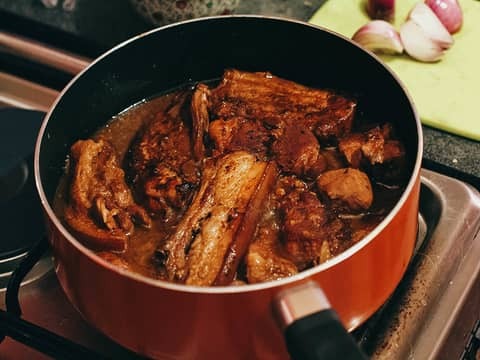 Adobo is so near and dear to every Filipino’s heart that it would be pointless to ask them the question “who makes the best adobo?” Why? Because everyone’s answer will always be, “my mother of course!” A comforting dish many of us grew up with, no restaurant version can ever measure up to mom’s adobo. Lugaw is a thick Filipino rice porridge. Similar to Chinese-style congee, you’ll sometimes hear the terms lugaw, goto, and arroz caldo used interchangeably. Lugaw refers to plain rice porridge. 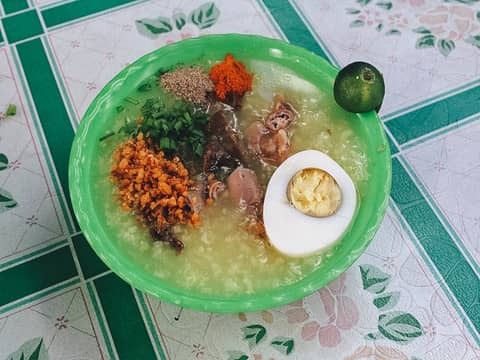 The term goto is used to describe lugaw with pork or beef offal, while arroz caldo refers to lugaw served with chicken. Lugaw is often paired with tokwa’t baboy, which is a side dish of boiled pork and deep-fried tofu served with vinegar, soy sauce, shallots, and chili. Like many Filipinos, I absolutely love this combination, especially on a cold rainy day! As far as I know, pork barbecue isn’t considered a Filipino national dish, but it should be. After all, many Filipinos grew up eating it. It consists of marinated pieces of pork skewered on bamboo sticks and grilled over coals. Think of it as a Filipino version of Indonesian or Malaysian satay. A favorite among children and adults, you’ll often find it served at office parties, picnics, and catered events. 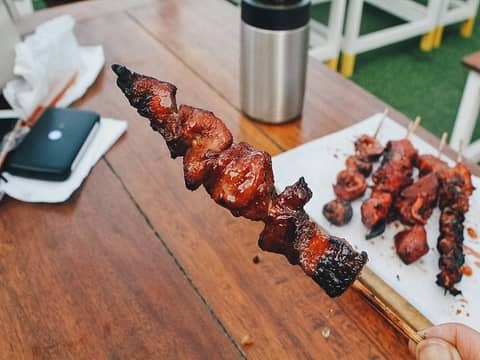 Most notably, it’s a staple at children’s parties where it’s offered together with Filipino spaghetti and red hot dogs skewered with marshmallows. Silog refers to a family of dishes served with meat, garlic fried rice, and egg. 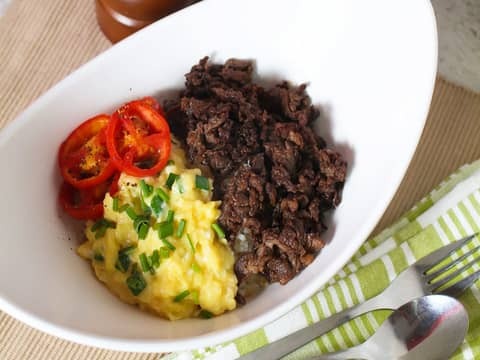 Typically eaten for breakfast, the most popular silogs are tapsilog, longsilog, and tocilog, which are all acronyms. For example, tapsilog is short for tapa (cured beef), sinangag (garlic fried rice), and itlog (egg). The “long” in longsilog refers to longganisa (Filipino sausage), while the “to” in tosilog refers to pork fatback. These three are the most common but there are others as well based on the meat that’s served. As described, silog dishes are typically associated with breakfast but they’re often enjoyed throughout the day. A plate of longsilog with Vigan longganisa is one of my absolute favorite comfort dishes in the world. I could eat it everyday and never grow tired of it! 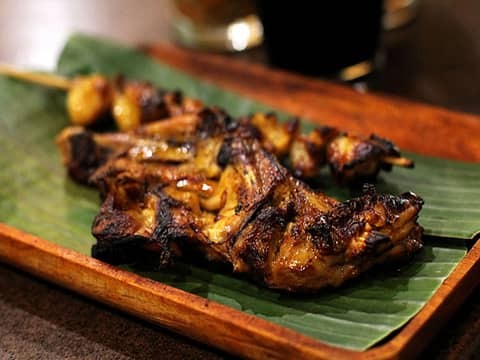 Inasal is a regional dish from the Western Visayas that’s now become popular throughout much of the country. It refers to grilled chicken marinated in lime, pepper, vinegar, and annatto. It’s typically served with rice and a vinegar, soy sauce, chili pepper, and calamansi dipping sauce. As far as I know, chicken inasal didn’t become popular in Manila until the last 15-20 years or so, but it’s become one of our favorite comfort dishes. In fact, Ren and I would go through stretches where we would eat at our favorite inasal restaurant every Friday night. We would always get the same thing. Ren would order the chicken bottoms while I went for the thigh and a plate of pork sisig. Yummers! Filipino food isn’t very healthy in general, but this is probably one of the least healthy dishes on this list. Chicharon bulaklak literally means “flower chicharon” and refers to deep-fried pork chitterlings or mesentery. If you’re unfamiliar with mesentery, it refers to the thin, web-like structure that supports the small intestine. When detached, it forms a frill or ruffled-like ornament resembling a flower, hence the dish’s name. Like pork sisig, chicharon bulaklak is one of the most beloved Filipino bar chow dishes. they are both also the most common dish you’ll find on the street. 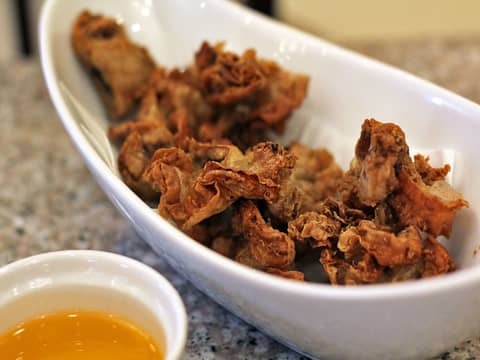 Typically served with a dipping sauce of vinegar, onions, and chili, chicharon bulaklak is one the most sinfully delicious things you can eat with ice cold bottles of San Miguel Beer. Sinigang is a savory-sour tamarind-based soup. It’s made with fish, pork, beef, shrimp, or chicken, along with a slew of vegetables like okra, white radish, water spinach, yardlong beans, and eggplant. Ren likes to ask people what their hypothetical last meal would be. “If you were to die tomorrow, then what would your last meal be?” Many Filipinos answer sinigang. 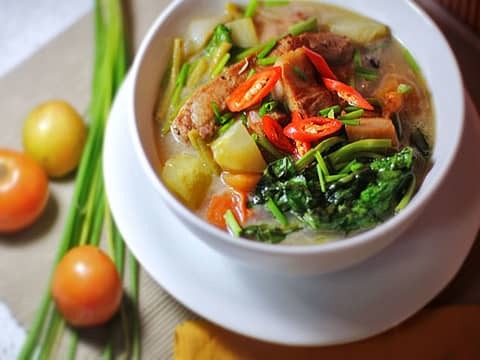 Sinigang is a comforting dish that many Filipinos grew up with. Like pork barbecue or adobo, it’s a dish that brings us back to our childhood.